I've had this gorgeous black frame with no glass for a long time, and I finally thought of something to do with it! My dining room wall has a bird theme, and as I was about to clip the hanging wire off this frame, I thought "Hey, it kind of looks like a telephone wire! Just needs birds!" 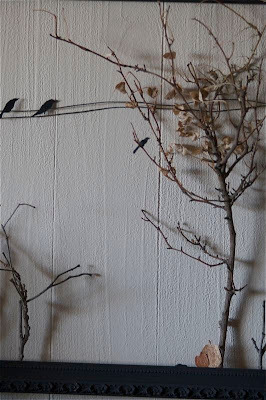 You could apply this concept with just about anything to make any kind of picture, but I used twigs from my yard (some with "bonus" dying leaves! Sweet! 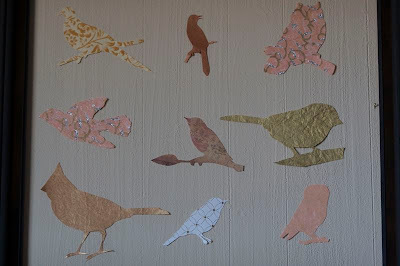 ), and scrapbooking paper for birds and pumpkins. It almost feels a little "Alfred Hitchcock", but the rest of the pictures on that wall tone it down. You can just barely see the little pumpkins at the bottom! 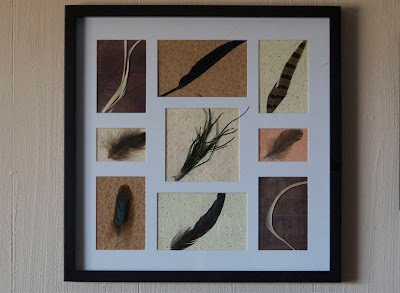 These are just some feathers that were lying around my house in various places with pretty papers behind them. 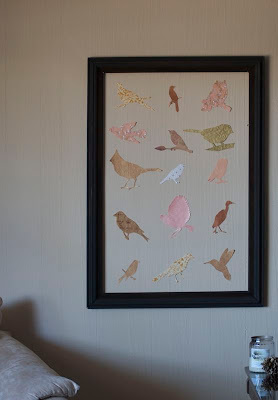 And this is a little bird cut-out collage in my favorite frame. It's huge! 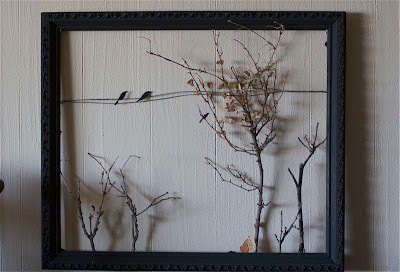 This frame has no glass either, so the birds (which I made by cutting around some pictures printed online) are just stuck to the actual wall with sticky-tack. And I kinda like it that way! A close up of some of the birdies! My living/dining area is almost done, so I'll have some pictures up soon! LOVE the first one and the others are lovely too! These are all such great ideas. Now I know what to do with the feathers the kids find outside. Can't wait to see your completed living room. Stopping by from SITS! Love these ideas! I'm so in to birds nowadays. It's funny, your the comment before me this morning, but last night I stumbled to your blog from another blog I subscribe to you. 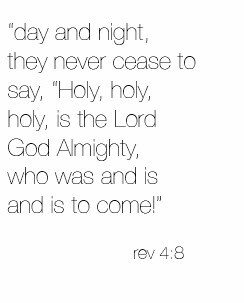 That is so neat. You are so creative, I am building a house and i will be back to your blog for some fantastic ideas. Absolutely LOVE the birds in the frame. I love old frames and windows and this gives me great ideas. Thank you so much. You are so creative! Can't wait to see what else more and try some of your techniques! Nice one ... love the dimensions !!!! ur little one looks real cute..